In the basic measuring & recording software a red dot on the monitor screen of the connected laptop/PC corresponds exactly to the tilting angle of the balance exercise system in use. As soon as a user is exercising on Sensbalance equipment the red dot on the screen wil move correspondingly and provide in this way biofeedback on the movements made. This can be used both for diagnostic and therapeutic purposes. 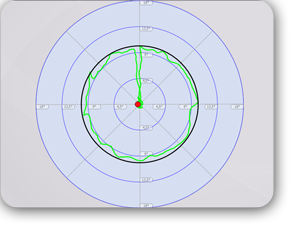 Movement of the red dot can be recorded and displayed as green trajectories on the monitor screen. follow the contour of an adjustable large circle as precisely as possible, which will show the coordinative abilities and symmetry of the movement. follow the axes as precisely as possible, which will show the abilities to curve your back in a coordinative manner convex, concave, or in a lateral direction. perform a free exercise. The therapist is completely free to instruct self-invented exercise patterns (e.g . in diagonal directions) on the screen. All movement trajectories can be recorded and stored in the client database or as a PDF file anywhere in a self chosen directory on your computer. Standard supplied are the Training Level and Easy Level of the “Balance” Exercise/Game software, to enable a motivating and challenging exercise environment. The Balance Game consists of a maze platform on the screen with one or more balls. The platform on the screen can be tilted by making body movements and the balls starts rolling within the maze and can be directed towards targets in the maze. The software games have a certain structure. Step by step the difficulty and challenge increases. The Training Level consists of 18 Training Games. It starts with simple movements in one direction. It continues with movements in two directions, circular movements and finally movements in all directions. While playing certain movements can be trained. The Easy Level offers 10 varying and increasingly challenging games. Mazes get complexer and the number of balls, which have to be directed simultaneously to their targets, increases. Controlling multiple balls asks for extra concentration, coordination and body control, and gives more and more results, satisfaction and pleasure when performed successfully.